New season, same old story with Tiger Woods. Only it’s no longer a happy tale. For the third time in his last eight PGA Tour events, Woods got into a cart in the middle of his round and was driven to the parking lot because of back pain. Most troubling about Thursday in the Farmers Insurance Open was he spoke only a week ago of feeling “great” physically, and this was only his second event of the year. He blamed this one on the weather, which caused his “glutes” to shut off. Woods walked off after 11 holes on the North Course at Torrey Pines, citing tightness in his lower back from standing around for more than an hour in the cool Pacific air during a fog delay in the morning. He never looked comfortable, and Billy Horschel noticed it right away. Woods was reaching for his back at the turn. Horschel tried to help by picking up the tee for Woods on their tenth hole and the ball from the cup when Woods made birdie. Woods now has gone 12 straight PGA Tour events without a top ten, dating to his runner-up finish in The Barclays in 2013 when back pain dropped him to his knees. This was his first round since a career-high 82 last week in the Phoenix Open to tie for last with a club pro and miss the cut by 12 shots. Nicholas Thompson had an eight-under 64 on the North Course and had a one-shot lead over Michael Thompson when play was suspended by darkness. Brooks Koepka, coming off his victory in the Phoenix Open, shot a 66 on the North. The best score on the tougher South Course belonged to Jhonnatan Vegas, who shot 67. Dustin Johnson, playing for the first time since his six-month leave for “personal challenges,” holed out for eagle on the fourth on the South Course as his lone highlight. He had five bogeys and was two over with one hole remaining. In his last six tournaments since back surgery last March, Woods has missed the cut three times, withdrawn twice and finished 69th in the Open, his lowest 72-hole finish in a major. “It’s just tough not seeing him have his best, whether it’s with his game or with his health,” said Rickie Fowler, who played in the group with him. Woods was two-over par through 11 holes and in a tie for 130th when he withdrew. He will fall to his worst world ranking since before he won his first PGA Tour event as a 20-year-old in 1996, and he most likely will not qualify for a World Golf Championship for only the second time in his career. He is not expected to play again until the Honda Classic in three weeks. Doral is the following week. He did not indicate earlier in the week that he would add tournaments to his schedule ahead of the Masters in April. In Kuala Lumpur meanwhile, Lee Westwood and Alejandro Canizares shared the lead on 11 under par at the halfway stage of the Maybank Malaysian Open. 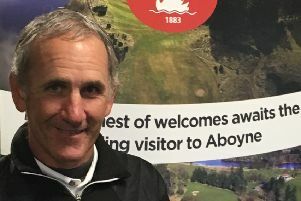 l After setting the pace, Bearsden’s Ewen Ferguson had to settle for seventh spot as Ugo Coussaud became the first Frenchman to win the South African Stroke Play Championship. Ferguson’s closing 75 left him nine shots behind Coussaud (68) in Port Elizabeth. Kirkhill’s Craig Ross also finished in the top ten, a shot behind his compatriot, following a closing 71.